When you do a web search for generator sizing, you will find plenty guides and online calculators. 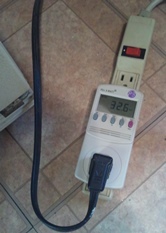 Most of them provide a list of typical wattages for common appliances. Unfortunately, their numbers may be inaccurate even when they come from major manufacturers. To demonstrate this, let me consider as an example the power consumption of a refrigerator. As we can see, these numbers vary from 132 W to 800 W! At initial power up the input current was 7.3A, which corresponds to more than 800VA. I realize the meter may not necessarily caught the starting peak current, which could be higher. By the way, I also measured the net energy consumption in a steady state operation over one hour- it turned out to be 0.13 kWh, which is 130W average rate. Of course, different models will produce different results. That’s why if you need to determine the required size of your genset don’t trust much any guide- just do the measurements by yourself. Update: For a complete step-by-step sizing procedure see my home generator review and buying guide.